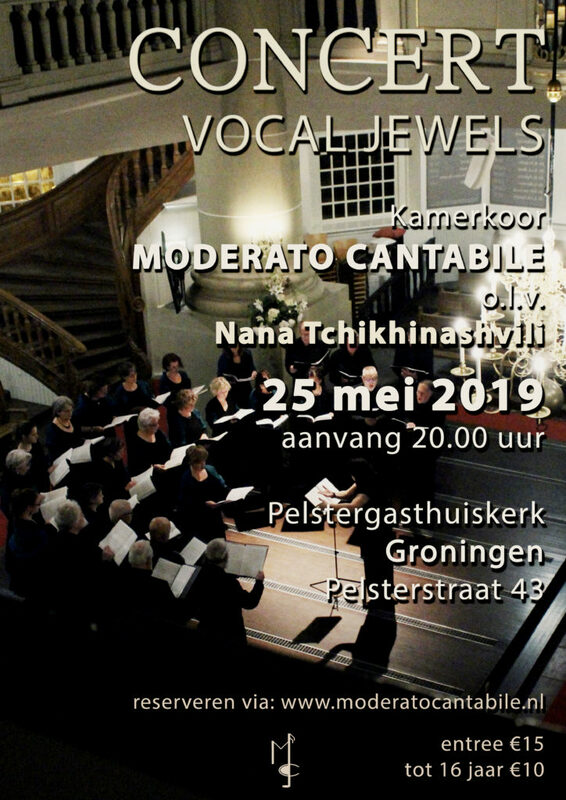 Moderato Cantabile is a Groningen Chamber Choir with an average of 28 singers, all with broad experience in choral music. The choir was founded in 2001 by conductor Nana Tchikhinashvili. On 14 and 16 December, the last successful concerts from the 2018 concert cycle of 'Vespers' by Rachmaninoff, were in respectively the Koepelkerk in Smilde, and in The Buitenplaats museum in Eelde. See the photo's on this website. Moderato Cantabile will continue from April 2019 to June 2020 with a particularly varied and audience-friendly concert program called Vocal Jewels, where the audience will be carried along on choral sounds from different continents and style periods, including some compositions by conductor / singer / composer Nana Tchikhinashvili herself. You may recognize some works such as "Song for Athens" by John Tavener, which was sung during the funeral ceremony of Lady Diana, "Miserere mei, Deus" by Gregorio Allegri and "O Nata Lux" by Morten Lauridsen. Fairly unknown choral works are also performed. All works are sung a cappella. Asked: 1st alt and 1st bass!